This article is about "international" chess (国际象棋, guójì xiàngqí) in China. For "Chinese chess", see xiangqi. China is a major chess power, with the women's team winning silver medals at the Olympiad in 2010, 2012, and 2014; the men's team winning gold at the 2014 Olympiad, and the average rating for the country's top ten players second in the FIDE rankings at the end of 2014. Chinese progress has been underpinned by large government support and testing competition in numerous tough events. 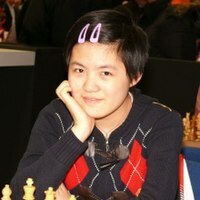 Currently nine of the world's top hundred players, including the world's highest woman player, Hou Yifan, are from China. However, countries like Russia, Ukraine, Germany, Armenia, and Israel still have an edge in experience over their Chinese counterparts. Chess has only gained popularity in China in the last few decades and still trails Chinese chess (xiangqi) and go (weiqi) by a considerable margin. There are about three million people in China who play chess, of which 300,000 are in the federation. In 1974 a seminal meeting was held in Kuala Lumpur that was attended by Malaysian Chess Association President Dato Tan Chin Nam, a prominent businessman; Lim Kok Ann, then President of the Singapore Chess Association; President of the Japanese Chess Association Yasuji Matsumoto; FIDE and Philippine Chess Federation President, Florencio Campomanes and two observers from the Chinese Embassy. The aim of this important meeting was to figure out how to raise the technical level of chess in Asia in order to reach the highest levels. It was decided to promote chess first in China where it was believed to have the biggest potential for success. The plan came to be known in Asian chess circles as the "Big Dragon Project" and the man behind it was Dato Tan Chin Nam. He was instrumental in gaining China entrance into FIDE in 1976 and has since backed Asian and Chinese chess in particular financially. The Big Dragon plan called for the Chinese to reach world-class status by the end of the century, something that was largely achieved. Chess in its current form was developed in medieval to early modern Europe where in the 19th century modern tournament play began, and the first world chess championship was held. The most accepted view is that the direct ancestor of the game, shatranj, was transmitted by the Muslims via Persia from ancient India, where it was known as chaturanga. Chaturanga is assumed to have also spread eastward to China, under the name of xiangqi ("elephant game"). According to the chess historian H. J. R. Murray, the earliest certain reference to xiangqi in Chinese sources dates to 762 AD (earlier passages containing the character xiang, which has several different meanings, cannot be proven to refer to elephant chess). 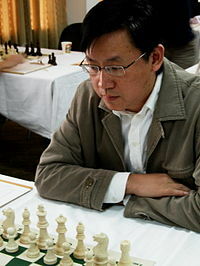 Xie Jun had two reigns as Women's World Chess Champion, from 1991 to 1996 and again from 1999 to 2001. The European form of Chess was only introduced in China during the 19th century but has never been as popular as Weiqi or Xiangqi. Alexander Alekhine was the first great chess player to visit China in 1933. In an exhibition played in Shanghai, he was held to two draws, one to Xie Xiashun, the leading xiangqi player of the first half of the 20th century and later nicknamed "Centurian chess king" because at 100 years old, he was a strong player in all the three strategy board games. 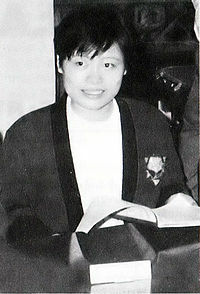 Xie, not related to former women's world champion Xie Jun, helped to promote the game and was the top player in China after World War II . In 1935, he visited Malaya and Singapore and defeated their champion as well as the British Air Forces champion Hunter. In 1936, in Guangzhou, the British sponsored a tournament with top players from Austria, Britain, China, Germany and the United States. Xie won the tournament convincingly by drawing one and winning the other 18 games. In 1987, Xie (who lived in Wenzhou) died at the age of 101. Chess was not listed as a competitive sport in China until 1956. In the same year, the 1st Chess Exhibition Tournament was held in Beijing, where only six players from four provinces participated. But at the National Chess Tournament held one year later, 22 players from approximate 10 provinces and cities were attending. From 1957 to 1966, national competition was almost held once a year and the number of players grew exponentially. The Chess Association of China was formed in 1962 as a minor affiliate of the Chinese Xiangqi Association due to the lack of popularity for the game at the time and only became a fully-fledged independent organization in 1986. It has been only in the last 30 or so years that chess has made major inroads in China, where the game is seen as the poorer cousin of the more popular xiangqi. Chess was banned during the first eight years of the Cultural Revolution (1966–1976), but by 1974 there was an easing of the ban that saw China begin to participate in international competitions, the first being in 1976. In the early 1960s, chess classes were conducted at Children's Palaces or Amateur Sports Schools in key chess cities such as Shanghai, Beijing, Wenzhou and Hangzhou. From the mid 1970s, junior chess classes have also been established consecutively in Chengdu, Guangzhou, Shanxi and Tianjin, where professional chess coaches were hired or arranged to deliver trainings. This has facilitated the growth of many young players. Many big names had been trained at those chess classes when they were young, such as female grandmasters Liu Shilan and Wu Minqian; female master An Yanfeng; male master Qi Jingxuan, Li Zunian, Liang Jinrong, Yang Xian, Lin Ta, Ma Hongding (马红丁, born in 1963) and Wang Li. Before the ban on chess was imposed in 1966, the Chinese national team played four international matches with the Soviet Union, represented by master players. After the end of the Chinese National Chess Championship Final in December 1958, three Soviet masters, Boris Baranov, Mamadzhan Mukhitdinov and Alexander Grushevsky visited China. They met top three finishers of Chinese National Chess Championship in Cultural Garden, Guangzhou. The Chinese lost all three games. In the game Grushevsky-Xian Quan (later known as Sin Kuen after leaving to Hong Kong) the Chinese had good winning chances in the middlegame but blundered badly and lost. The USSR team then went to Shanghai and Hohhot, where they met local chess players and defeating them all as well. In 1963, China invited a Soviet team to play the return match. To prepare for the match, the Chinese National Sports Committee from June 14 – July 15 selected over 20 players from all over the country to form a National Chess Training Team: Deng Wenxiang, Feng Bingrong, Feng Zuquan, Hong Kemin, Hou Chengji, Huang Xinzhai, Jian Mingji, Li Chengyi, Li Zhongjian, Li Zhu, Liu Chengwan, Liu Zhenguo, Lu Zhuoran, Qian Zongxiang, Wang Bijun, Wu Weiwen, Xu Hongshun, Xu Jialiang, Xu Tianli, Zhang Donglu, Zhang Fujiang and Zhu Fushan. 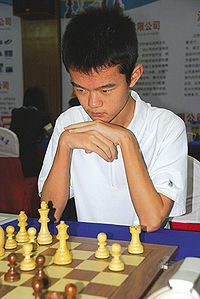 Jian Mingji, the young player from Guangdong, who changed his name to Kan Wai Shui when he left to Hong Kong, took the first place in the round robin qualifying tournament. In early September 1963, the following qualified eight players from their results: Xu Tianli, Jian Mingji, Deng Wenxiang, Xu Hongshun, Zhang Donglu, Huang Xinzhai, Feng Bingrong and Li Zhongjian. They traveled from Shanghai to Beijing to meet the Soviet team. In September it was confirmed that the Soviets would be led by GM Andor Lilienthal, and other two players were IM Mikhail Yudovich and Vladimir Zagorovsky. As preparation the Chinese team looked at their opponents’ games in order to analyze their style of play and predict what kind of strategy or tactics would be used. Beijing (September 8–12, 1963): the soviet team arrived at the Yuexin Palace, Beihai (North Sea) Garden, Beijing, to play the first three rounds of the match with a total of nine games. Huang Zhong, Chinese Deputy Chairman of the National Sports Committee also attended to watch the match. 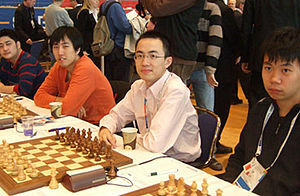 It was the first occasion that Chinese chess players had met strong foreign players. They played cautiously and fought hard with tension and excitement. Although the Chinese did their best, the Soviets were just too strong for them, winning six games and drawing three. Shanghai (September 16–20, 1963): the teams then played in Shanghai, where the venue was Shanghai Sports Club to host another set of three rounds. Huang Xinzhai, the young player from Shanghai, scored historic win against Zagorovsky in 6th round, which was the only Chinese success in the whole match. Huang Xinzhai was a fan of xiangqi since his childhood and he won in 1957 the Shanghai Secondary School Xiangqi Championship. He learned chess from Xie Xiaxun (Centenarian Xiangqi King) and, in 1959, he won the 2nd National Chess Games Championship in Shanghai. Later he won the Chinese Chess Championship in 1965. Hangzhou (September 22–24, 1963): the last two rounds (with a total of six games) were played in Hangzhou. The match was won by the Soviet team +15=8-1 overall. Even though the Chinese team lost by a large margin again, compared to the previous meeting in 1958, the Chinese leading players' abilities were vastly improved. It was noted that the Soviet and Chinese players often analyzed together just after the finished game showing good friendship and respect. The Communist Party and Chinese authorities also took interest in the match, as when the USSR team arrived in Beijing, the Chinese Premier Zhou Enlai himself greeted and received the Soviet players with honours. The third match was played in Moscow in 1964 with China being led by the Chief of National Sports Wushu (martial arts) Mao Bohao, while five team members were Jian Mingji, Xu Tianli, Zhang Donglu, Xu Hongshun, Huang Xinzhai. They arrived on June 4. This was the first time the Chinese national chess team played abroad. They played three matches. The first one was played in Moscow University resulting in five draws. But the second round, played in the club of automotive factory in Moscow, was a one sided battle. Only Xu Tianli scraped a draw, while others lost. The third match was played in Moscow Chess Association's hall. The Chinese lost all the games. In 1974, at the invitation of the Malaysian business tycoon Dato Tan Chin Nam, then President of the reorganized Malaysian Chess Federation, China was invited to attend the 1st Asian Team Championship with observer status. It was also in 1974 that China held its first National Championship tournament. The first international tournament ever held in China was in 1980. In 1975, Dato Tan Chin Nam decided that chess in China had enormous potential, and set-up the "Big Dragon Project"; the aim being to see China dominate the chess world by 2010. He said, "I am behind the cause of chess in China for my whole lifetime. And after me, my children will carry on." China now holds every title in the women's game, and are now starting to make progress in the much tougher men's game. Dato Tan Chin Nam also founded the Tan Chin Nam Cup in China – a competition that sees top GMs from Eastern Europe meeting Chinese players. Also in 1975, the Chinese Chess Association officially joined FIDE. China came second in the next Asian Team Championship held in Auckland, New Zealand in 1977. China was second again in the next two editions in Singapore in 1979 and in China in 1981. China won the series for the first time in 1983 in India, and won the inaugural women's event in Singapore in 1995. China came second at the Asian Team Championship in their debut in November 1977. After that, China won the Asian championship for the next two consecutive years. In 1983, China defeated the Philippines Team, the then titleholder of all previous Asian Chess championships and won the winning the title of Asian Champion. At the 6th National Games in 1987 in Guangdong, chess together with traditional I-go and Chinese chess were listed as competition items and held for men's teams and women's teams. China has taken part in the Chess Olympiads since 1978, the first in Buenos Aires, Argentina. It was here that the Chinese soon put themselves on the map when one of their players, Liu Wenzhe, rated a mere 2200, defeated in spectacular style with a stunning queen sacrifice a top western grandmaster, the hapless Jan Hein Donner of The Netherlands, in just 20 moves. Since then, China has made rapid progress with the women's team taking the bronze medal and the men's team coming sixth at the 1990 Olympiad, and a few days later, China was eventually awarded the special status of "one-zone federation" (3.5). They won over or drew some of the strong teams and finally ranked 18th. China's women went on to retain their position in the next two Olympiads and in 1996 won the silver medals. Meanwhile, the men's team never have ranked below 15th place. In December, 1980, three Chinese teenager girls made their debut on the international games. They drew the world champion, USSR Team in the Chess Olympiad and tied for 5th place. In the later Chess Olympiad held every two years, China continued to make progress. At the 27th Chess Olympiad held in Dubai, UAE, they tied for 3rd place. 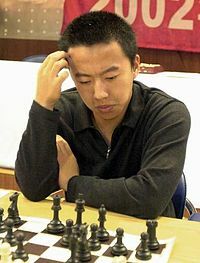 Chinese grandmaster, Liu Shilan, who played on the first board ranked third of that board, was granted the Best Player. China Women's Team surprisingly won over several tough games with teams such as former World Runner-up, Bulgaria and former World Bronze Medalist, Romania. And they lost the game with USSR Team only by 1 to 2. China Men's Team also got prominent results in the past two sessions of the Chess Olympiad. The team tied for 8th place in the 26 Chess Olympiad in 1984. In the 27th Chess Olympiad held in 1986, where 108 teams participated, they drew the former World Champion, Yugoslavia Team and tied for 5th place with Bulgaria and Iceland by 9 victories, 1 draw and 4 losses. This was the highest place ever achieved by Asian Men's Team in Olympiad. The best result in the past was 11th place achieved by Philippines. The performance of Xu Jun, top player of China Team, was especially remarkable. Chinese players also made improvement in Individual Chess Competitions. Liu Shilan won 1st place in Asia by sweeping the board in 14 games, entered World Champion Candidate Competition, namely the quarterfinal, and was entitled grandmaster. In 1985, An Yanfeng, Wu Minqian and Zhao Lan swept the first 3 places in Asian Area Competition. 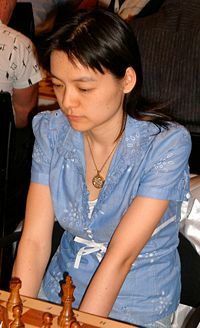 Wu Minqian later was admitted to the quarterfinal and won the title of grandmaster as well. Other women players got excellent results in international competitions. An Yanfeng, Zhao Lan and Wu Xiaoying were entitled masters. Ning Chunhong won 2nd place in Asia. He Tianjian, Xie Jun and Peng Zhaoqin were invited to visit USSR. Many Chinese men players have beaten world famous grandmasters in international competitions. In the Asian Area Qualifying Trial held in Laoag, Philippines, Chinese players Qi Jingxuan, Li Zunian and Ye Jiangchuan swept the top three prizes. In the 1990s, Chinese women chess players reached the summit of the world and men's team also achieved world class level. Chess became far more popular as a result of Xie Jun becoming the women's world champion in 1991. She made a historical breakthrough for the non-European players in this field. After retaining her title match in 1993, interest in chess was raised even further with an estimated one million chess players in China. China Women's Team won 1st place in 1998 Olympiad for the first time. At the same time, men players like Ye Jiangchuan, Zhang Zhong and Ni Hua also gradually gained excellent results in various competitions. Officials of the Chinese Chess Association have been appointed by the National Sports Committee which also provides funding. The three strategy board games share a common headquarters called QiYuan (Chess Academy) normally with a dormitory with twin-sharing rooms on the top floor. The three respective national chess associations operate in China QiYuan situated in Beijing, while Beijing has its own (local) Beijing QiYuan. Similar structures were also set up in most major cities and today, there are more than 30 Qiyuans in China. At these Qiyuans, the paid officials run their day-to-day affairs and trainers conduct chess classes. Each QiYuan has its own management committee. At the (National) China QiYuan, the Chairman is Chen Zude who is also the President of the Chinese Chess Association. Every QiYuan had been allocated state subsidies to the three strategy board games. Since the restructuring of the Chinese government in May 1998, sports had to fund themselves by 2001. During the three year transition period, funding from the government was reduced by 30% each year. Fortunately for the Chinese Chess Association, in 1993, it received an endowment fund from Singapore businessman S T Lee who donated about US $1.5 million. 10% of this donation was for the establishment of the chess library at China QiYuan. The remaining 90% were deposited in a fixed account from which the Chinese Chess Association drew interest mainly for its administrative operations and to send players for overseas competitions. In 1997, the Chinese Chess Association founded a computer company to fund its other activities on an annual basis. Decision making is done collectively and any final decision is only taken after thorough discussion and more important ones are referred to the Sports Committee. Since May 1998, all Qiyuans have been autonomous from China QiYuan but still they cooperate like one organization. Another major benefactor was Prof Lim Kok Ann (1920–2003) who managed to move sponsors into investing in chess in China via the creation of the Dato Tan Chin Nam and ST Lee Cup tournaments. He was most helpful to the Chinese women talents; opening doors for their participation in tournaments in Europe with the aim of seeing the Chinese attain world-class standards. His and others' efforts helped, in part, contribute to the creation of two Women's World Champions, Xie Jun (1991–1996, 1999–2001) and Zhu Chen (2001–2004) (ref.). The first visit of world champion Anatoly Karpov in August 1997 boosted the popularity of chess further. During this visit, Karpov played three exhibitions in Beijing which were broadcast live on television. He also appeared for a one-hour talk show viewed live on prime time slot during the most popular TV program in China. His visit was widely publicized across China and because of his unusual popularity, he was invited by the government to another visit in May 1998. Karpov's second visit took him to Beijing, Shenyang, Shanghai and Guangzhou – four of the five largest cities in China. He also took the opportunity to launch the Chinese edition of his book Disney's Guide to Chess and appeared to autograph his books at major bookstores in each city he visited. There were 20,000 copies for the first printing and more than half were sold within one week of his visit. Karpov played a total of five exhibitions and once again, the immense publicity raised the interest of chess to another level. At present, in terms of media publicity, chess is ahead followed by weiqi and then xiangqi. In terms of playing interest, weiqi still commands the lead followed by chess and xiangqi but it has been estimated that 10 million people have learnt to play chess by 2000. On a site inspection visit by Tang Kum-Foo and Ignatius Leong from Intchess Asia in February 1998, among 5 cities they visited was Wenzhou, a commercial seaport on the eastern coast. There they were invited to 3 kindergartens and witnessed about 2,200 children playing chess in classrooms. All the teachers there knew and taught the game to the children. China's first men's Grandmaster Ye Rongguang and female Grandmaster Zhu Chen come from Wenzhou. Based on statistical criteria, Wenzhou is the only city awarded the status of "Chess City" by China QiYuan. There are more than 1,000 chess trainers in China and about 300 professionals. The Beijing City Center Youth Championships held in August 1998, saw 574 children contesting the age-group championships; 233 for chess, 187 for xiangqi, and 154 in weiqi. In 1981, China organized the Asian Team Championship in Hangzhou. In 1990, China hosted the second part of the Women's Candidates Final Match between Yugoslav Grandmaster Alisa Marić and GM Xie Jun. The 1993 Women's Candidates Tournament won by Hungarian Grandmaster Zsuzsa Polgar was played in China. In recent years, were the S T Lee Beijing International Open and the Dato Tan Chin Nam Invitational Tournaments. In 1998, the controversial Women's Candidates Final Match between Russian Grandmaster Alisa Galliamova and GM Xie Jun in August and the first ever Asian Chess Open were held in Shenyang. The registration of Galliamova and her subsequent non-appearance for the match had been a talking point among the Chinese people and a daily forum in the press. For September 1999, in celebration of the 50th anniversary of the People's Republic of China, the city of Shenyang had won the right over international cities to host the second edition of the World Cities Team Championship. An industrial town with a population of 6.5 million people, Shenyang hosted the Asian Sports Festival which included 30 non-Olympic sports and chess. About 1,500 participants from 40 countries took part in the 2-week festival. In 2000, Shenyang unveiled the largest regional QiYuan in China with space to hold 1,000 players, estimated to have cost US $25million. Following the World Cities Team Championship, Shenyang hosted the 1st FIDE World Cup (won by Viswanathan Anand and Xu Yuhua in the men's and women's section, respectively) and the Shenyang Open Tournament. Four Grandmaster Tournaments were held in other cities. Shenyang also organized the Asian Team Championship, the S T Lee International Open, the Tan Chin Nam Cup Grandmaster Tournament and two more Grandmaster Tournaments have been regularly held in other cities. In 2003, Judit Polgár played two simultaneous exhibitions in Shanghai and Wuxi, with +31=7–2 and +29=5–2 results. She also played a six-game blitz match against Bu Xiangzhi, winning 5–1. After that she visited Beijing as a tourist with her husband. Chinese media covered her visit extensively. In September 2003, The Kings and Queens rapid chess tournament was held in Yong Chuan. It was won by the tandem pair of Nigel Short and Zhao Xue, who took the title a full point ahead of their nearest rivals, Yasser Seirawan and Zhu Chen. After the Kings and Queens tandem chess matches the players flew to Jinan to play normal chess in the Three Arrows Cup. The Beijing Chess Challenge Match was held later in September in the China Resources Hotel, Beijing, which had an international team versus two Chinese teams: International Team players: Evgeny Bareev g RUS 2721, Nigel Short g ENG 2701, Yasser Seirawan g USA 2626; Chinese Team A players: Ye Jiangchuan g 2683, Zhang Zhong g 2658, Xu Jun g 2626; Chinese Team B players: Bu Xiangzhi g 2588, Zhang Pengxiang g 2567, Ni Hua f 2533. The 16th World Computer Chess Championship, the 13th Computer Olympiad and the Conference on Computers and Games 2008 (CG2008) was held in Beijing from September 28 to October 5, 2008 . The 1st World Mind Sports Games took place in Beijing after the 2008 Summer Olympics from October 3–18, 2008 . Twenty five to thirty gold medals was vied for an estimated 2000 competitors from 150 countries. There were five mind sports, being chess, bridge, go, draughts and xiangqi. The Games were under the aegis of GAISF and organized by the International Mind Sports Association (IMSA) of which FIDE is a founding member. For chess players, there were competitions of Rapid and Blitz chess for individuals, pairs and teams. The Individual was limited to 50 players, men and women. In the pairs event, teams of one man and one woman from each federation participated, maximum 50 teams. In the teams events, maximum of 80 men's teams and 50 women's teams were invited with teams of 4 players plus one reserve. Altogether 10 gold medals was available for chess plus a trophy for the leading federation over all chess disciplines. A Super GM Six-player double round robin Tournament event took place in Nanjing, Jiangsu from December 10–22, 2008. The six players were Veselin Topalov g BUL 2791; Vassily Ivanchuk g UKR 2786; Levon Aronian g ARM 2757; Sergei Movsesian g 2732 SVK; Peter Svidler g 2727; Bu Xiangzhi g CHN 2714. It was the strongest tournament ever held in China (at least by Elo average, 2751.6, making it a category 21 tournament). The Nanjing tournament will become one of the grand slam events similar to Corus chess tournament, M-Tel Masters, and Linares chess tournament. The First National Mind Sports Games took place in 13 to 23 November 2009 in Chengdu, Sichuan. The event is sponsored by General Administration of Sport of China and was participated by over 2, 600 competitors from 46 parties in China, took part in some 43 events of six disciplines. Chess is one of the games amongst another six games (weiqi, xiangqi, chess, contract bridge, gobang, draughts). The chess section has 8 gold medals: open team rapid, women team rapid, open individual rapid, women individual rapid, open individual blitz, women individual blitz, boys team classic, girls team classic. In the 3rd Asian Indoor Games in Vietnam, China won three Gold, two Silvers and a Bronze, topping the overall medals table. The November 2010 Asian Games in Guangzhou featured chess. China won a total of five medals; three Golds, a Silver and a Bronze medal. The first two Grand Slam Finals were held in Bilbao, Spain. The first year (2008) it was a 6-player double round-robin won by Veselin Topalov, and the second year (2009) a 4-player double round-robin was won by Levon Aronian. For 2010, the event was split into two parts: the first half occurred in Shanghai (September 3–12). 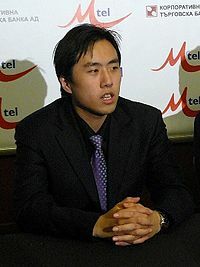 The four participants in the first stagewere: Wang Hao, as best Chinese player (20th ranked); Alexei Shírov, as best Spanish player (9th ranked); Levon Aronian, as winner of the Final Chess Masters 2009 (5th ranked); and Vladimir Kramnik (4th ranked). The second half was held in Bilbao (October 6–14). The top two qualified in Shanghai played in Bilbao along with Magnus Carlsen, winner of the tournaments in Wijk aan Zee, Nanjing and Bazna, and Viswanathan Anand, the then-World Champion. The 39th Chess Olympiad in Khanty-Mansiysk was played from September 19 – October 4 in between the two parts. Tan Zhongyi won the 2017 Women's World Chess Championship, succeeding Hou Yifan, who had held the title since 2010. Previously there were three Chinese players who have been Women's World Champion, Xu Yuhua (2006-2008), Zhu Chen (2001–2004) and Xie Jun (twice: 1991–1996; 1999–2001). The current strongest ranked Chinese player is 26-year-old Ding Liren, ranked 4th in the world as of November 2018 with a rating of 2816. Chinese players have the highest average rating of any nation on the most recent FIDE list. Their 330 players average 2245. China has produced 38 Grandmasters and 21 Woman Grandmasters in total. ^ "Country rank by average rating of top 10 players". FIDE. May 2015. Retrieved 2015-05-14. ^ "Nanjing: Bu draws first blood in Super-GM". 12 December 2008. Retrieved 16 November 2013. ^ The Big Dragon Project. Daily Chess Columns. ChessBase.com. ^ "Chess in China". 18 September 2003. Retrieved 16 November 2013. ^ "Kings win Three Arrows Cup". 21 September 2003. Retrieved 16 November 2013. ^ "The Beijing Chess Challenge". 28 September 2003. Retrieved 16 November 2013. Liu, Wenzhe (2003). The Chinese School of Chess. Batsford. ISBN 0-7134-8773-9. Google search for "Chess in China"
This page was last edited on 6 March 2019, at 02:05 (UTC).